Bill is now retired from university work but runs a regular contra dance. In a contra dance, parallel lines of dancers stand opposite -- or "contra to" -- their partners. A dancer and his/her partner form a couple. Each couple interacts with the couple next to them to form a four person set. There is an interesting connection between rotations of a cube and the changing arrangments of these four people during the course of the dance. Here is a video. Chris Page, a well know contra dance caller and choreographer wrote a technical article The twenty-four duple minor formations." His work inspired this Contra Cube paper and in this video I tell him about my findings while refering to his paper. A type of contra dance called grid squares has some interesting mathematical properties. It's a great topic for students to explore next time I get a change to work with some keen kids. I've tried such a dance, Simple Pleasures a grid contra by Bob Isaacs at my local contra dance. The maths was presented at Bridges 2011 "Mathematics, Music, Art, Architecture, Culture" at the University of Coimbra in Portugal. Some mathematicians and callers, Rachel Hall, Bob Isaacs, Amy Ksir and Rick Mohr have collaborated on a paper "The Dynamics of Grid Square Dances." Here is a paper I wrote about grid squares. After looking over the paper you might want to watch this video analysing "Simple Pleasures." Bill and nine students worked through this presentation: "Tricks and Tangles." We looked at number and rope tricks and then explored how two ropes can get tangled as part of a mathematical dance. Now that I'm retired, I'm more involved with contra and square dance, but this topic combines math and dance. Check out the videos "Knotted" and "Undancing t t t". The material comes from a square dance with ropes invented by John Conway and discussed on the bottom of page 10 in his article The Power of Mathematics. A series of rural community events - a traditional NZ barn dance in the evening followed by maths entertainment the next day. It's purpose was to show the human face of mathematics - meet the practitioners in a social setting and learn about what makes them keen about maths. 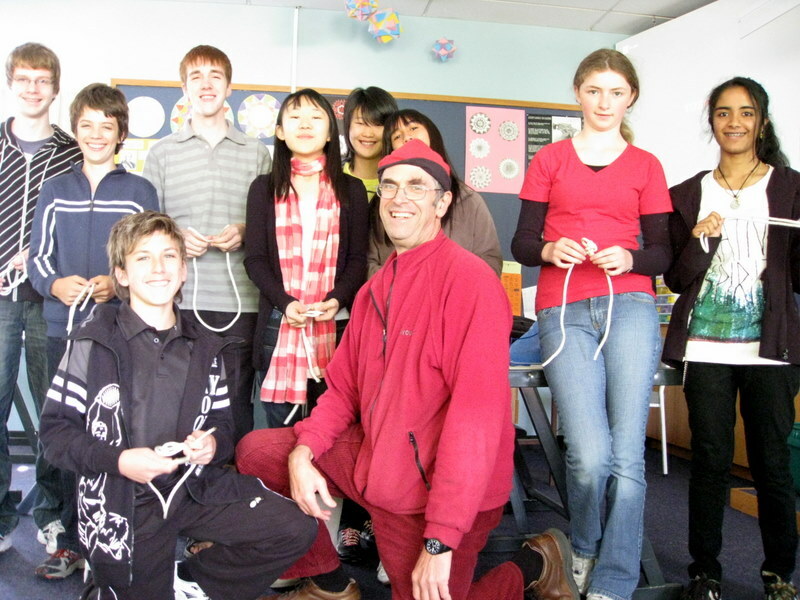 The project was funded by the Royal Society of New Zealand with support from the University of Canterbury Mathematics and Statistics department. The dance of mathematics proved a successful way of improving the image of mathematics and related science. The project was extremely successful in enthusing the wider public about mathematics. Over 2500 person hours of exposure were generated with the barn dance and math events. Top mathematicians conveyed their passion and knowledge. Additionally the media picked up on the project and over 70000 person hours of media exposure were generated.